Olive ascolane—with their soft and savory meat stuffing surrounded by a crisp, breaded crust—are a speciality of Ascoli Piceno in the region of Le Marche, but they have become a staple on the tables of pizzerias in Rome, where I lived for so many years, and elsewhere in Italy. They are perfect for nibbling on, washed down by the house white wine, while you wait for your pizza to arrive. Olive ascolane are so popular, in fact, that they sold ready-made in specialty shops and even frozen in supermarkets. You just fry them up at home and, truth be told, they are none too bad. Oddly enough, even with the burgeoning interest in Italian cooking abroad, this is one dish that seems to have gone pretty much unnoticed. So if you want to try this delightful snack outside Italy, you’ll probably need to make it yourself. And that’s just what I did this week. Tasting this long time favorite after so many years brought back some fond memories! Yes it’s a project, but well worth it! The recipe, I have to admit, is neither quick nor particularly easy, so I would plan to make them on some morning or afternoon when you have time to spare. There are several steps to it: sautéing the meat stuffing in a typical Italian soffritto of onion, carrot and celery, then puréeing and seasoning the stuffing mixture with cheese and spices, then pitting and stuffing the olives, then rolling them in flour, egg and breadcrumbs and then, finally, frying them in abundant olive oil. Each of these steps will take its time, although using pre-pitted olives will, of course, save you some considerable work. Stuffing the olives itself can be pretty fussy—and a bit messy, as can the breading process. But each step can be done in stages, whenever it’s convenient. The final step of frying the olives takes no time at all, and can be done at the last minute. And unlike most fried foods, the whole thing can be made ahead; olive ascolane are equally delicious served at room temperature or gently reheated. Olive ascolane are categorized as an antipasto, but to me they’re the perfect finger food with cocktails. Leftovers makes a fine quick snack. They also make a nice addition to any fritto misto. Step 1: Make the stuffing: In a large skillet, gently sauté the onion, carrot and celery, along with the pancetta if using, in olive oil until the onion is soft and translucent, seasoning with salt and pepper as you go. Add the ground meats and break them up and mix them with the soffritto. Sauté until the meats have lost their raw color, then add a splash of white wine and simmer gently until the wine has evaporated, about 10 minutes or so. Remove the skillet from the heat and let the mixture cool completely. Transfer the mixture to a food processor and process until you have a smooth paste. Transfer the paste to a mixing bowl and add the grated cheese, breadcrumbs, egg, and spices. Turn everything together with a spatula or wooden spoon until you have a uniform mixture which is soft but compact. If it’s bit too loose or too moist, add more breadcrumbs or grated cheese to the mixture. Place the mixture in the fridge and let it rest there for at least 30 minutes. If using pitted olives, split them down the middle vertically, leaving a bit at the bottom connected. Open the olive like a book and insert a small amount of the stuffing mixture, then press the two sides back together to re-form the olive. If using unpitted olives, you’ll need to pit them. You could use an olive pitter, but the traditional method is to use a small paring knife to cut the flesh away from the pit in a spiral motion. Of course, your olive will not retain its shape. Rather, you’ll wind up with a spiral strip of olive. You then take a small ball of stuffing and wrap the olive strip around it, “reconstructing” the olive, as it were, slightly larger than it was before. Step 3: Bread the olives: Set up three bowls with the flour, egg and breadcrumbs. Now, as if you were making breaded cutlets, flour each stuffed olive lightly, shaking off the excess, then dip it in the egg and finally roll it in the breadcrumbs. Roll the breaded olive between the palms of your hands to give it a nice round shape. As you go, set the olives out to dry a bit. Although not absolutely necessary, it is a good idea to repeat the process for a uniform and crispy crust; since olives have a rather smooth, round surface, the breading (for me at least) tends to be uneven on the first go. Step 4: Fry the olives: Once all the olives are breaded, fry them in abundant olive oil until they are golden brown, turning them frequently so they cook evenly. Drain on paper towels or a baking rack. Olive ascolane can be served warm or room temperature, as you prefer. But unlike most fried foods, I would not eat them straight from the fryer, unless you enjoy a scalded tongue! Essential for successful olive ascolane are, of course, the olives themselves. The olives should be green, rather large and mildly flavored. Italian recipes are unanimous in calling for the ancient local olive from Ascoli Piceno called the Ascolana Tenera, which is cured in a very gentle brine with just a hint of wild fennel. You should look for something similar where you live. I found some Sicilian olives from Castelvetrano at the local Whole Foods, which more or less fit the bill. They are sweet, mildly flavored green olives, although a bit smaller than you might ideally want, which made stuffing them a bit fussy if not impossible. The Cerignola olive from Puglia is larger and would likely make for easier stuffing. Really small, strongly brined olives like the Gaeta or Nicoise, or dried ones like the Beldi from Morocco, as lovely as they are to eat, would not do for this dish. The exact mixture of meats and their proportions vary a lot from recipe to recipe. Beef and pork are more or less mandatory, but I think the choice here of equal shares of beef, pork and poultry makes for a nicely balanced flavor, even if this Wikipedia article rather disdains the addition of poultry. A bit of cured pork, pancetta or lardo or perhaps some mild sausage, intensifies the flavor, although Maria Batali’s version with fennel salami sounds, frankly, like an attempt to ‘dumb down’ the recipe. Veal sometimes makes it into the mix as well. Transfer the mixture to a food processor and process until you have a smooth paste. Transfer the paste to a mixing bowl and add the grated cheese, breadcrumbs, egg, and spices. Turn everything together with a spatula or wooden spoon until you have a uniform mixture which is soft but compact. If it's bit too loose or too moist, add more breadcrumbs or grated cheese to the mixture. Place the mixture in the fridge and let it rest there for at least 30 minutes. If using unpitted olives, you'll need to pit them. You could use an olive pitter, but the traditional method is to use a small paring knife to cut the flesh away from the pit in a spiral motion. Of course, your olive will not retain its shape. Rather, you'll wind up with a spiral strip of olive. You then take a small ball of stuffing and wrap the olive strip around it, "reconstructing" the olive, as it were, slightly larger than it was before. Good Mansion Wines in Wheeling, WV now imports the Ascolana Tenera del Piceno DOP olive — the correct olive to use — from Tempera in Ascoli Piceno, as the store makes its own olive all’ascolana stuffed olives for sale. They are available for sale at goodmansionwines.com but quantities are very low now, but will be replenished in the spring of 2018 with the 2017 harvest. Thanks for the info. Dominick. Good to know! I’ve seen recipes for these tasty olives but have never tried making them myself as they seem like so much work. Good for you for making them…I’m sure they were delicious. le olive ascolane sembrano facili da preparare invece è una ricetta che occorre seguire scrupolosamente a anche la frittura va fatta a regola d’arte, le tue mi sembrano perfette 🙂 complimenti! I made this recently and they were a huge hit with our guests from Italy. They said, “We didn’t know you could buy them in the U.S.!” I explained that I had made them, and they were so surprised, saying they they didn’t make them in Italy – they simply went to the street vendor, bought them, and brought them home! I felt so proud. Yes, as you say, Frank – they are a lot of work but they are so worth it! You have good reason to be proud, David. Italians are very demanding when it comes to food, as I’m sure you know. And what more, this is a challenging recipe. Kudos to you! A bit labor intensive but so worth the while, these are the perfect little bite for late afternoon summertime prosecco. Your stuffing recipe, ingredients & procedure is ideal and I look forward to trying the olives soon…any excuse for a quality nibble with my prosecco. Frank – I have never made these but have eaten them and loved them. My favorite restaurant in Philly – Le Virtù – makes a delicious version. I’ve never seen these for sale in the freezer section of supermarkets, but will be on the lookout. sigh. I had tears in my eyes as I read this recipe…. I had these in Italy three years ago at a family reunion in the Veneto. My sister-in-law must have spent the day at it! She said she pitted the olives by laying them on a cutting board and pressing a chef’s knife on them. If I remember correctly, she used mortadella and not pancetta in the filling. The rest is pretty much the same as your recipe. Pretty darn good washed down with prosecco as they are quite salty. These little beauties are always on my radar! I simply adore them…have been wanting to make some but have yet to get around to it…thanks for the push. Some recipes call for the spiraling of the olive while others call for stuffing them using a pastry bag and I have not seen the technique for opening them up book like but sounds somewhat easier than the other two methods. I have even located a good source for the Cerignola olives that are pitted so I’m doing my homework! Believe it or not, the first time I had them and fell in love with them was at an Italian restaurant in Victoria, B.C. The owner hired an Italian lady to came into the restaurant to make them every day! They were so good! The minute I showed hubby the recipe he said “We’re making it ASAP!” They look delicious and so uniform. I would imagine that the double coating would be necessary for that nice look. Wish we would have come across these appetizers when we were in Rome. Have a great weekend. You, too, Marisa Franca! And good luck with the olives. They’re quite the project but I’m sure you’ll both enjoy the outcome! I have been making these for years around the holidays. When I put them out they disappear. I admire your dedication, Joe! These olives are incredibly good but definitely a project for the cook. Yes, indeed, making a smaller batch would definitely cut down on the work involved! I had these for the first time last year in Rome and LOVED them! (What’s not to love?) I need to make these soon as they’ve been on my “to make” list since I tried them! Thanks, Frank! Yes, finding the right kind of olives is key—but worth searching out. Oh my god Frank these sound fabulous! 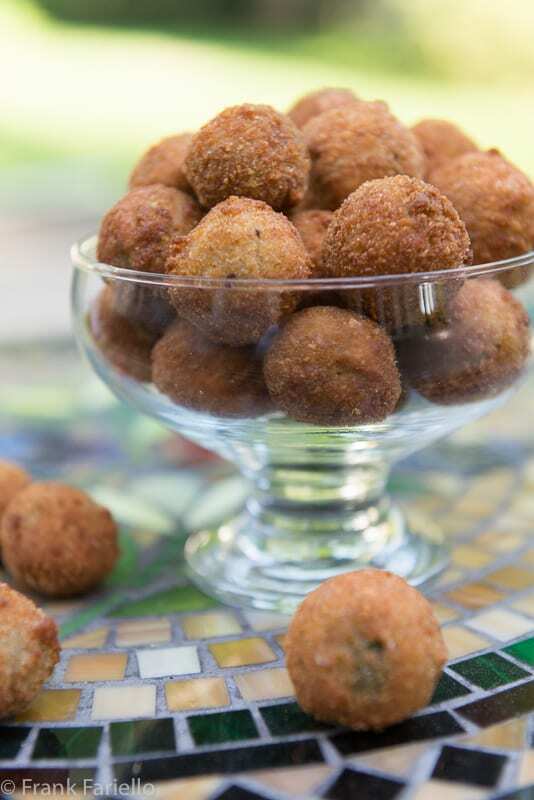 I’ve always wanted to try deep fried olives ever since I had them at a wine tasting, but I’ve never heard of these! Maybe because they are a little more involved, but oh, so worth it! Definitely worth a try, Mimi! Yes, I called for ground meat here because it’s much more practical for the home cook—and personally I can’t tell any difference myself in the resulting taste or texture. It all gets ground up again anyway. I would love to make these. I am an English woman living in South West France, not too far from Spain, where they are very popular, stuffed with bits of cured ham, red peppers, anchovies etc, and have found jars of large olives in the supermarkets from time to time. The problem is stoning them. I have a stoner which is fine for small olives, but no good for these. Any suggestions gratefully received. Gill, you can use a paring knife to cut the flesh from the stone (aka “pit” as we say here in the States) in a kind of spiral motion, as mentioned in the recipe. Stefano has left a useful link in his comment above that leads you to a YouTube video that illustrates the technique.